This Sentry Electronics Labs Heavy Duty Electromagnetic Lock is designed for strength, durability, and security. It has a holding force of 1200 lbs, so it is unlikely that the lock will be forcibly compromised; the strength of the magnetic force is improved with a zinc finish. 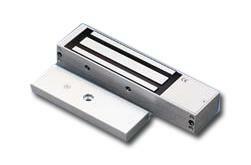 Unlike other electromagnetic locks, this model is weather resistant, so it can be installed on outside doors. The locking mechanisms are totally sealed in an epoxy filled stainless steel case with a threaded conduit. The water resistant design also prevents tampering by vandals. Additionally, this product is functionally tested from 14 F to 131 F, which allows it to operate in a wide range of climates. Because the resilience of this lock is so reliable, property owners can be assured of the security it provides, and the manufacturer is so sure of its durability that it offers a 5-year warranty.